Areas of sleet and freezing rain are also likely as we head into the rest of the day. Travel will be difficult. The winter storm is here. Here's a look at how things will break down for the rest of the day and into Monday. 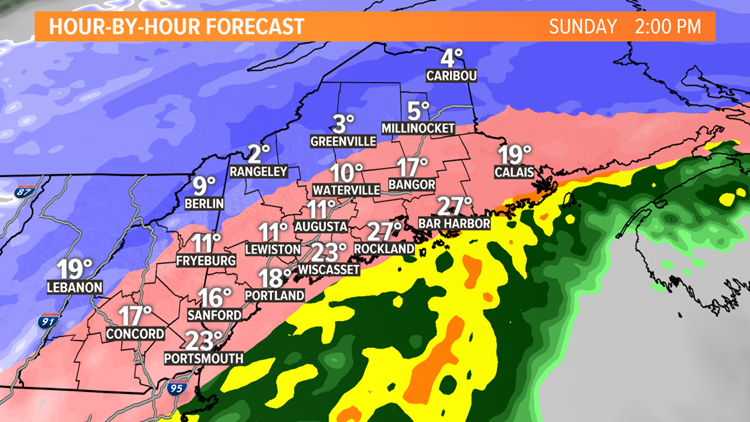 SUNDAY MORNING: Steady snow will continue for much of the area to start the day. As we head into mid-morning, some mixing may start to occur into far southern Maine. Sleet is likely, with some pockets of freezing rain as well. It will continue to stay windy. This will help to blow and drift the snow around, dropping visibility. It'll be very cold as well. 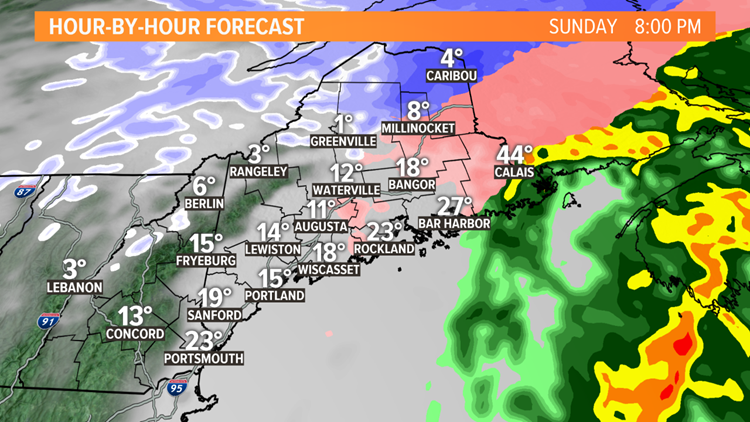 SUNDAY AFTERNOON: Areas of mixing will continue to move inland. 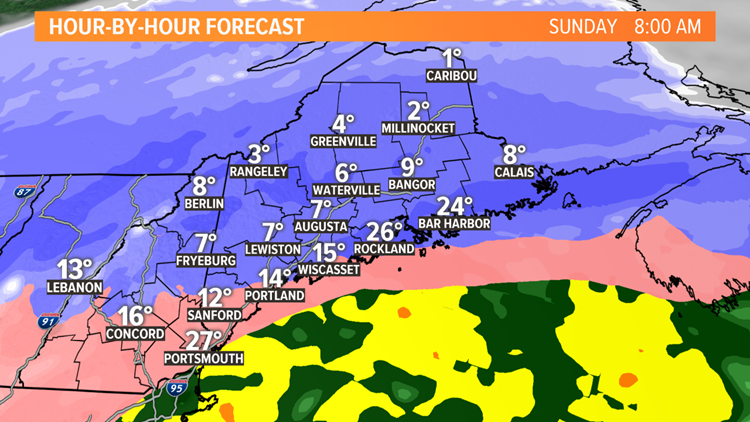 This could be as far inland as Lewiston, Auburn, Augusta, and Bangor. Sleet is likely, on top of the snow that already fell. Freezing rain is still a concern closest to the coast. Power outages are possible. Winds will continue, with gusts approaching 30 MPH. SUNDAY NIGHT: The bulk of the precipitation moves northeast. Southern, western, and central Maine will begin to quiet down. It'll still be icy and snowy for northern and eastern areas of the state. Winds will continue, as well as the very cold temperatures. Wind chills will be well below zero. MONDAY MORNING: Monday morning will be a lot quieter in terms of precipitation. However, it'll be extremely cold. Temps in the single digits and some areas well below zero. You factor in the winds, which will still be gusty, wind chills will be dangerously cold. 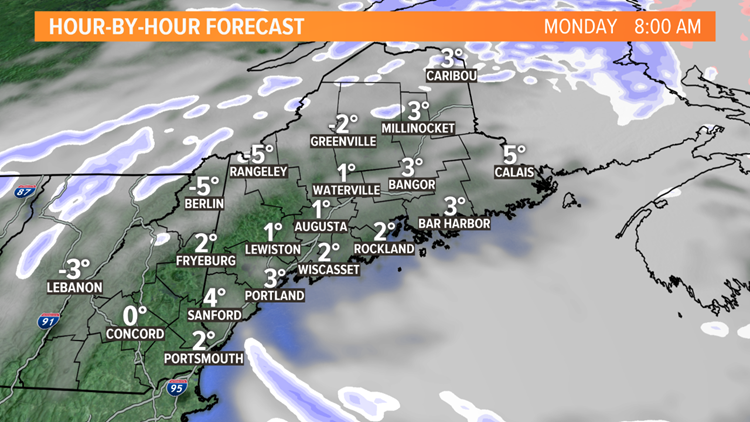 If you need to be outside early on Monday, please cover up any exposed skin, as frostbite is a concern. Coastal flooding is also a concern. High tide will be around 10 AM, Sunday. Minor to moderate flooding is possible. Some beach erosion could happen as well. 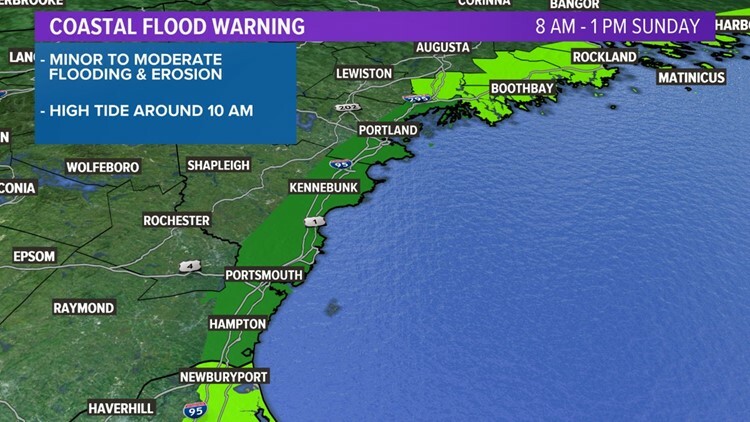 Coastal flooding is a possibility. 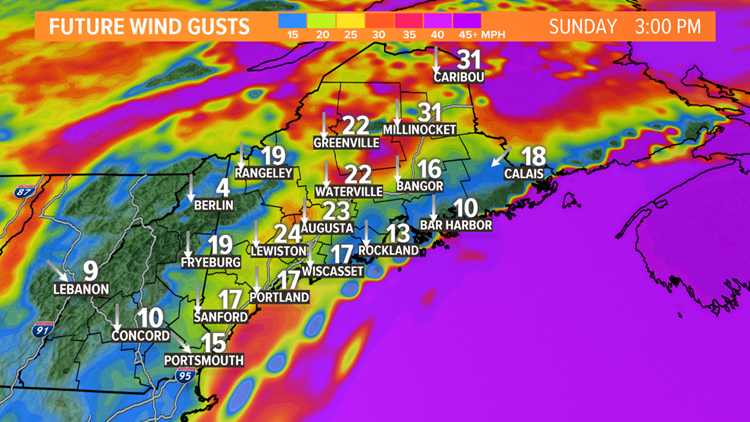 Winds will gust close to 30 MPH into Sunday. This will help to blow and drift the snow making travel very difficult. Gusty winds will continue through Tuesday. Be sure to download the NEWS CENTER Maine app for any updates, if you're away from your TV. Be sure to catch our later newscasts as well.